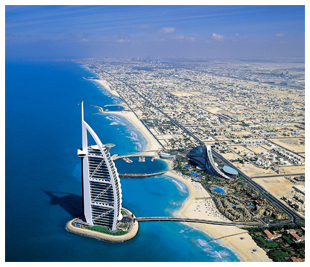 About Burj Al Arab: Situated 1,053 feet above the Arabian Gulf in Dubai sits the incredible Burj Al Arab. Built upon the livelihood of sea men and women, this grand hotel stands as a constant reminder of the immense wealth the sea can provide. 21st century Arabic architecture accents the insides, and butlers will tend to your every whim. Immensely popular around the world, this hotel has brought countless visitors from abroad to witness their spectacular visual extravaganza. As on of the most photographed structures in all the world, this hotel shares alliance with none. It’s immense beauty is world renowned and is the centerpiece of many articles and magazine excerpts for the most popular architectural magazines. Search for a few pictures about this immense structure, complete with a 390 foot tall internal atrium, and you’ll find some pretty amazing stuff. This site should be number one on the list of attractions to check out in Dubai. Resting on an artificial island, this hotel is also the second tallest in the world. As long as you don’t count the buildings that have more than one purpose, the Burj Al Arab sits comfortably as number two. Even though it’s so tall, the Burj Al Arab only has a total of 28 floors. Pretty hard to imagine a structure of this size with so few rooms, but it’s true. In the center of the dining room is a giant aquarium, allowing visitors to gaze comfortably at the aquatic scenery. The dining room remains elegant as ever, with a blue tint taking center stage. With more than one restaurant, visitors have more than one dining locale to choose from, and an even more extensive menu selection. The Al Muntaha and the Al Mahara dining areas can be the perfect ending to a luxurious night amongst friends. Taking a vacation to the immensely wealthy city of Dubai wouldn’t be complete without at least staying one night at this magnificent hotel. Car rentals, dry cleaning, meeting and business center, high speed Internet, and valet parking are offered. A hotel with such a wide range of services simply can’t be beat. And, to top it all off, the hotel is only few miles from the DXB airport. If you visit, be sure to take a camera and lots of film. Both inside and out, the Burj Al Arab stands to make quite an impression on anyone who sees it. Spa and beach facilities are also part of the attraction, and room service comes to turn down your accommodations twice a day. All of the reviews on the Burj Al Arab are in as well, all with spectacular results. The great majority of people who stay at this hotel have nothing but incredible things to say. Stuff like, “If I had more money, I would blow it all on another night at the Burj Al Arab,” and “This is the best hotel I’ve ever stayed at in my whole life, like being hosted in heaven!” Feedback like this is common place, and nobody knows hotel business like Burj. If you plan to be in UAE check this out too!